These tunes for kids are southern like grits mixed with the humor of Jeff Foxworthy and the schooling of Mr. Rogers, splashed with witty hilarity, sprinkled with just the right amount of quirkiness and topped with entertaining enlightenment. 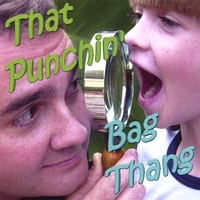 "That Punchin’ Bag Thang" is a CD filled with all kinds of flavors for kids and their parents. And you thought the ice cream store had a lot of flavors. You'll enjoy singing and laughing with Jeff and Kaitie Ann with every new flavor. The title cut "That Punchin’ Bag Thang" has the kids singing high, low, fast, slow, loud, soft, long, and short as they discover the "secret" to Jeff's singing success. You'll also love the "Loose Tooth Blues" written especially for those kids who have lived to tell about it. Oh, and don't forget to sing the alphabet . . . backwards in "ZYXWV". With many other flavors to choose from you will not want to pass up the hours of fun and entertainment packed into this one CD.